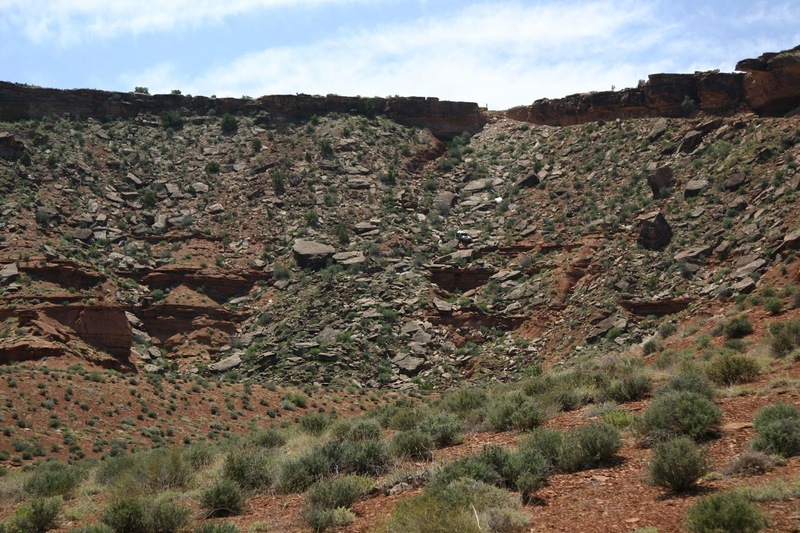 That lighter red stripe at the edge of the cliff on the left side of the photo? That's the road. 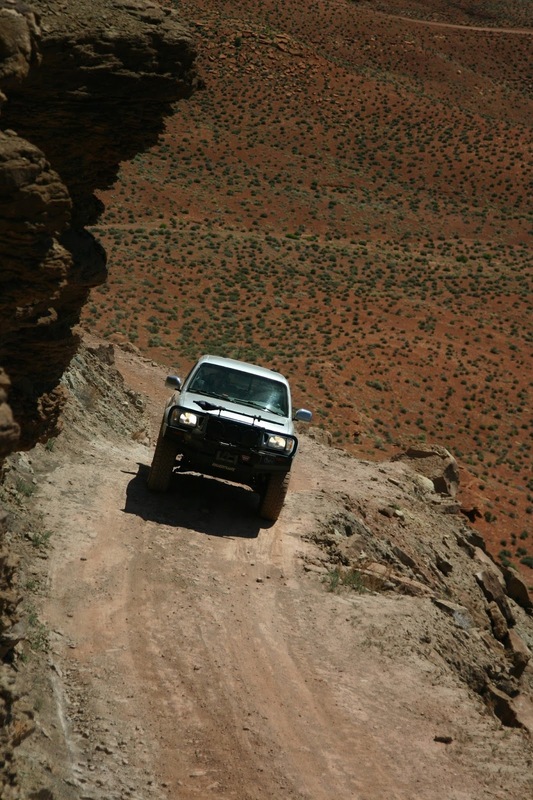 If you think it looks like you could easily drive right off the edge, you'd be right. The sweat on my palms mixed with the red dust on the armrest, creating an unappealing paste in the crevices of my hands. 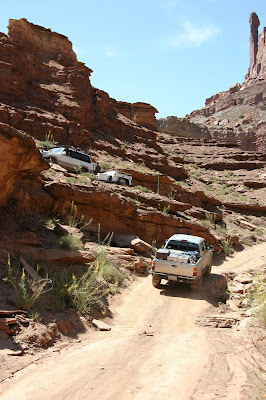 I wiped them on my shorts as we peered over the hood of the truck at the latest section of switchbacks. The (barely) one lane road began with a pavement of loose rocks, led down under an enormous overhanging boulder, then disappeared around a corner, all at a downward 45 degree angle. 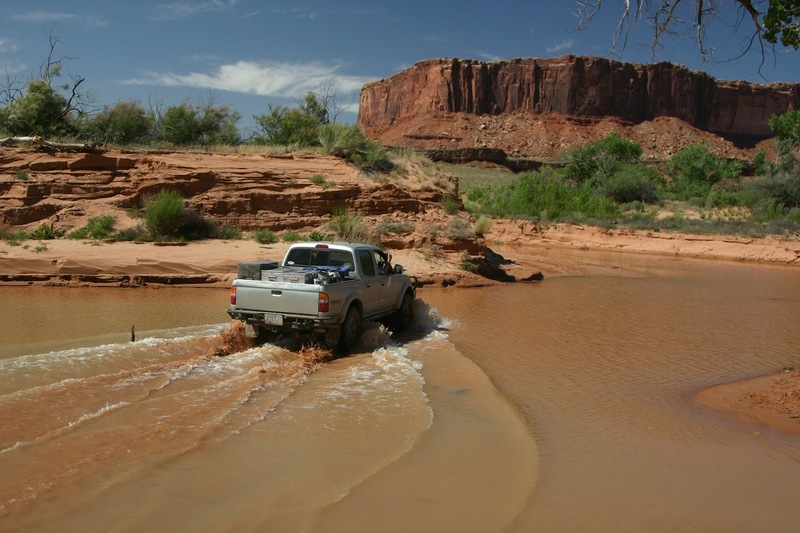 Mark had a grim look on his face as he put the truck into 4x4 low and shifted to the lowest gear the Ford has. I guess we're gonna do this. 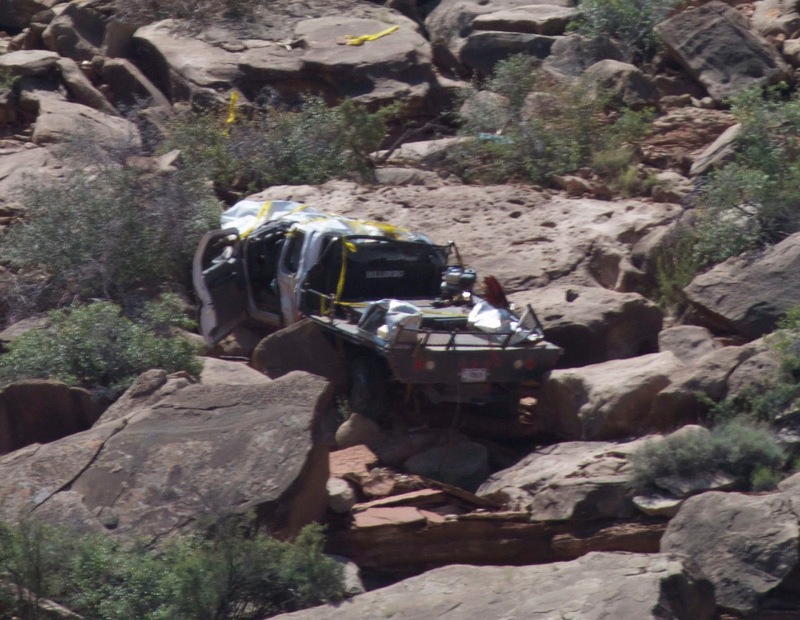 "Solo vehicle accident on May 2, 2016. 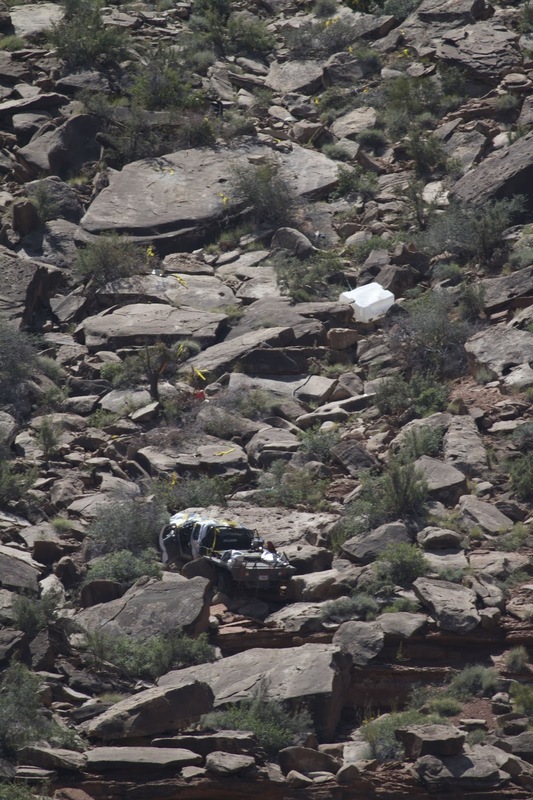 Survivor airlifted to hospital." Roads don't usually intimidate me, but this was no ordinary road. At this point in the trip the White Rim had already pushed the limits of our truck: steep switchbacks with turns so tight we had to shimmy around them; rolling sheets of slick rock with crevices that had us analyzing our angle of approach and departure; narrow cliffside sections with blind corners that would make a diehard atheist pray to just about anyone if it would guarantee no oncoming traffic. Now the road was throwing us a new twist: overhangs that threatened to rip the camper off the truck. Starting the trip; the base of the Shafer Switchbacks, Islands in the Sky district. I wouldn't be writing this if we hadn't made it down those switchbacks in one piece and yeah, I'm probably being dramatic. But when we got to the bottom and looked up to see that wrecked truck from three weeks ago still wedged between two giant boulders, yellow flags left by the accident investigation marking the trail of debris, it kind of sobered us up. 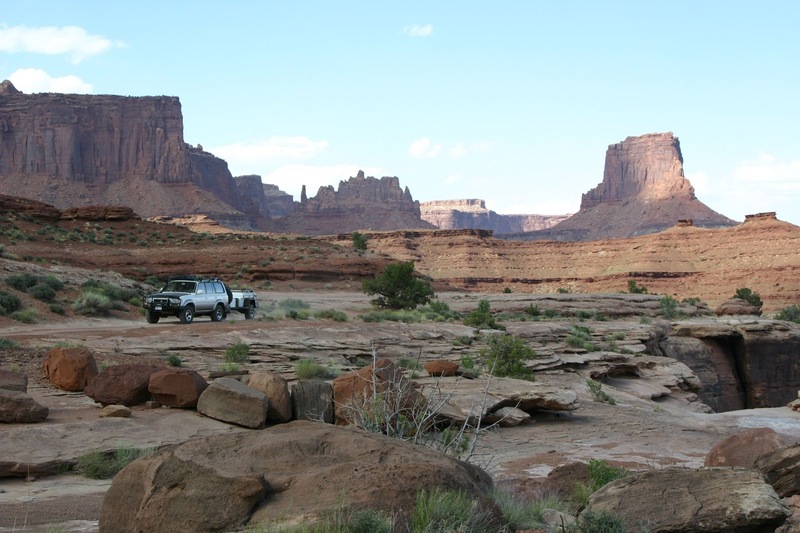 For years we'd been wanting to drive the White Rim Road. 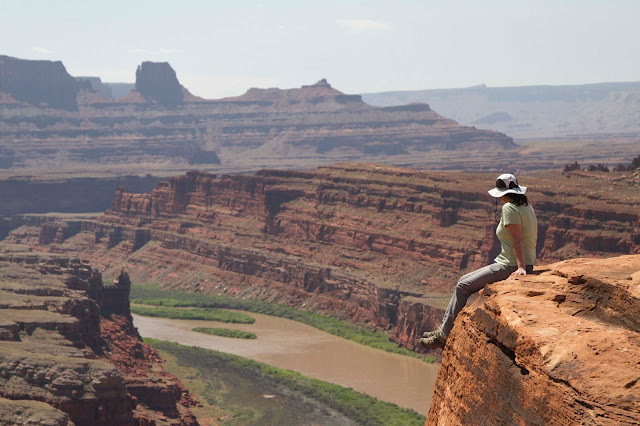 We had visited Canyonlands before and done the typical drive to the overlooks, peering over the edge at the vast network of canyons created by the Green and Colorado rivers. And way down there near the bottom, a dusty road wound around the edge of the river cut cliffs. "Someday," Mark would tell me, "someday I wanna do that." It was a challenging road, one that used all those lessons they taught us over the many years of attending Overland Expo, along with the ones we had learned the hard way in places like Death Valley and the backcountry of the Sierras. I think that's the reason Mark wanted to do it, for the technical challenge. What I enjoyed most was the view. 100 miles of winding multi-hued canyons stretch out to the horizon. Each thick layer of rock the river had exposed had a distinct color, and (as you've probably guessed) the layer the majority of the White Rim road travels has a white tinge (check out this cool pamphlet about the geology of Canyonlands for a more complete understanding of the layers). 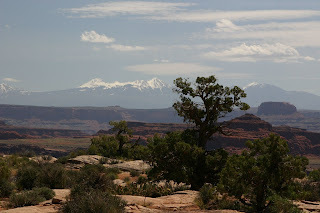 The scenery was always spectacular and would change from a soft hazy red in the morning, to harsh shadows and bright edges at noon, to glowing red at sunset. 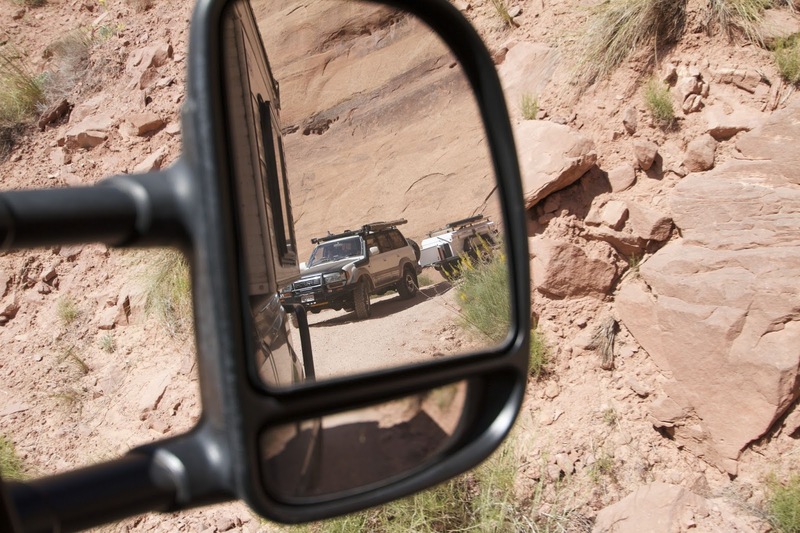 Ryan and LeeWhay's Lexus/Adventure Trailer combo skirts the edge of the canyon. Nothing can really compare to camping out in the middle of all that. Our little group had reservations at Gooseberry Campsite, scored by our friends six months before. We were almost the only ones there (there were a couple hearty mountain bikers camped across the road). Once the sun went down, it was dark and quiet but for the ever present wind that seems to follow us when we're in Utah. 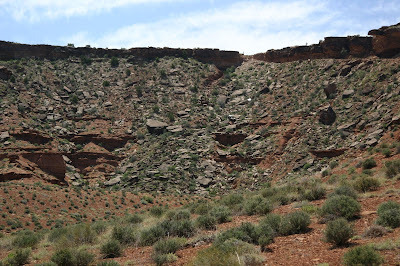 Like most of the road, campgrounds in the canyon are perched on the edge of cliffs; it isn't a good idea to wander off in the dark without a headlamp. Stargazing is pretty good, although there's a pretty healthy glow coming from nearby Moab, so it's not quite as spectacular as some of the other remote locations in Utah. Lined up at the cliffs edge, Washer Woman (the rock formation above) in the distance. Although the White Rim is not for the faint of heart or those who are fond of their shiny paint and low profile tires, it is possible to traverse it in a stock SUV (not that I'd recommend it). 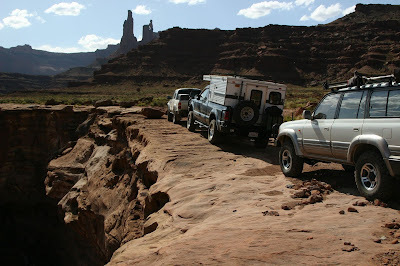 About halfway through we met a couple of guys who were doing just that in a Nissan Pathfinder. 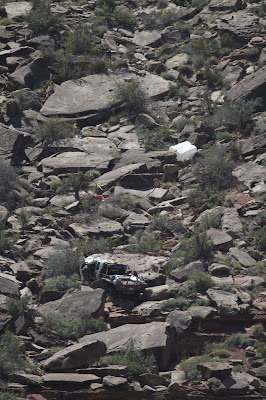 They said they scraped a little here and there, bottomed out pretty hard once or twice and it took them an hour to get up one of the steepest hills on the route. As we drove away, we were sure they'd be needing a tow out of there but a couple days later we saw them, alive and victorious. It should be noted, however, it was a rental. If you choose to go, make sure you have more than one night reserved in the campgrounds. The road is tough, and the smartest and safest way to enjoy it is slowly. Our campsite was only 30 miles in, which made for a long drive out the next day. It was the general consensus that one more night at the 60 mile mark would have made the perfect trip. From start to finish it's 100 miles long, and unless you drive over a cliff, none of that will be at freeway speeds. We averaged about ten miles per hour, not counting the side trips and photo stops. 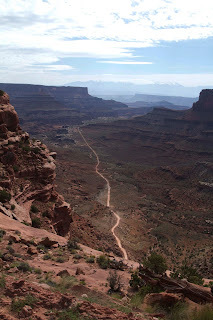 There were sections that could only be traveled at a crawl; it's just not safe to go very fast up those switchbacks, not knowing what might be coming around the corner. Our group brought two way radios so the lead vehicle could always radio back if they encountered someone on the road. It was helpful to have that extra warning, as there aren't many places to pull over in some sections. The road is also popular with mountain bikers, so keep an eye out for them. We saw more bikes than vehicles during our trip; we tried to be considerate and wait for them to pass before kicking up more dust. 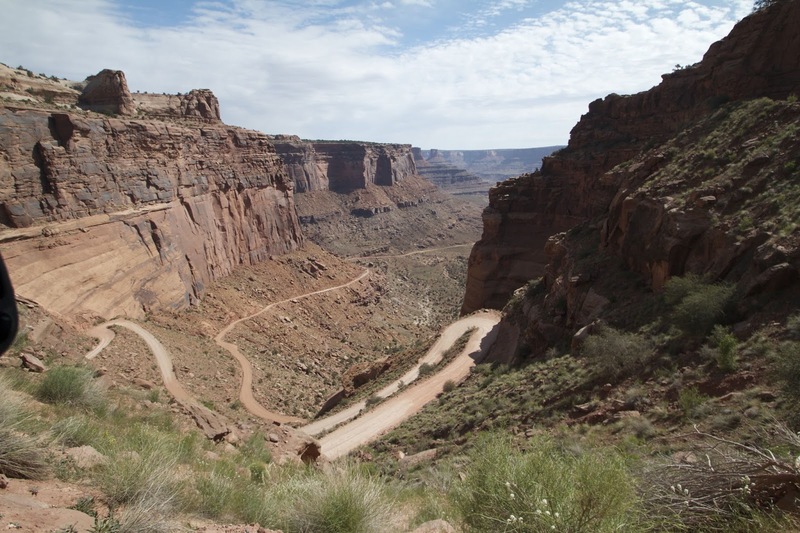 The Shafer Switchbacks get you down into the canyon from the Islands in the Sky Visitor's Center. 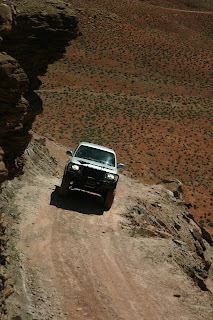 As scary as this might look, it was the easiest part of the road. Most of this section is wide enough for two cars to pass, or at the very least, find a spot to pull over. 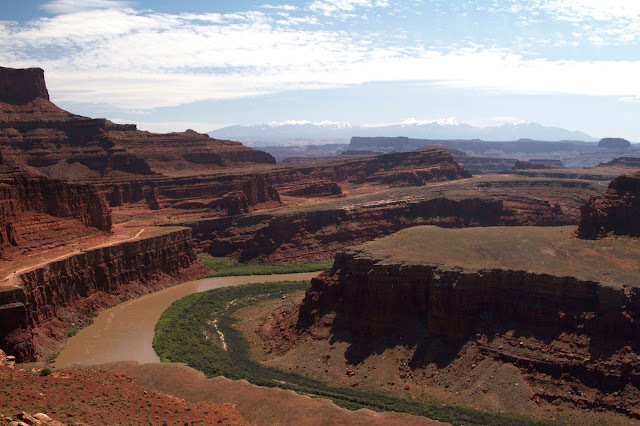 There is a section that crosses the Green River when water is high: all the more reason to check in at the Visitor's Center before you go down. A few days before we went, the water was too high to cross, which would have meant backtracking 70 miles out of there, a daunting prospect for us with our 10 cylinder gas eating truck. 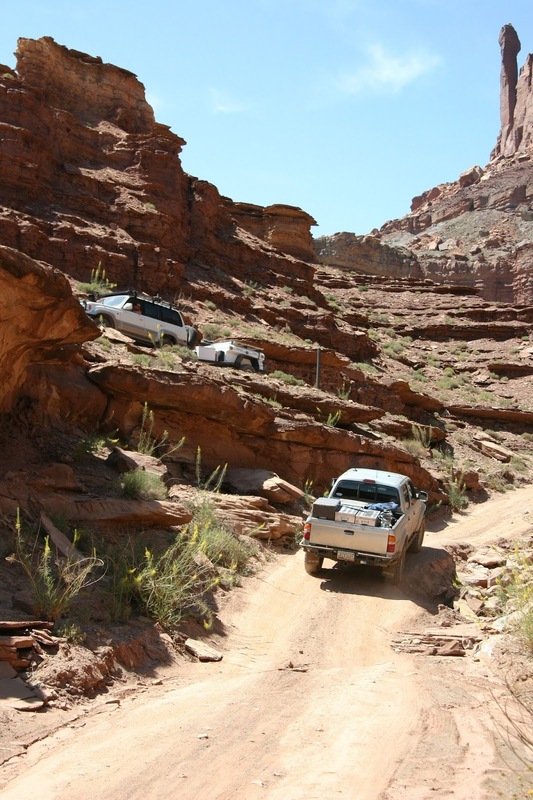 Our friends had obtained a permit for our group to travel through, as well as the campground reservations. Everyone who drives the road, even just for the day, has to have a $25.00 permit. You can get them online at: https://canypermits.nps.gov/index.cfm or at the Visitor's Center. Please note, these fees are in addition to the park entrance fee. We could have made this trip on our own, but it was definitely safer to travel with a group. A misplaced rock or a moment of inattention could cost you anything from a slashed tire to a smashed oil pan to your life. Having those extra eyes looking for hazards and warnings about the conditions ahead made the trip less stressful. And when you add in the extra cooler space for beer and snacks, the interesting camp chair conversation at the end of a long day of driving, and the general shared experience of the road, it was a no-brainer. We can only hope our buddies enjoyed this trip as much as we did. 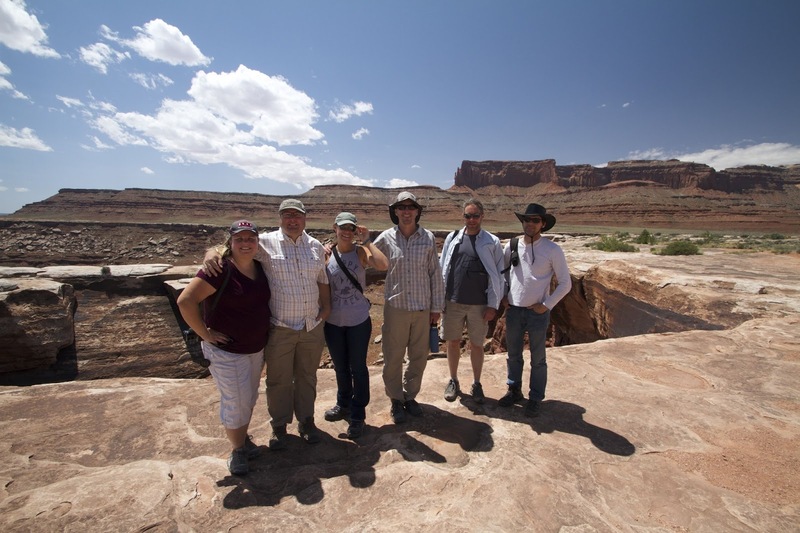 The White Rim crew: Rasa, Craig, Leewhay, Ryan, Mark and Ron. Explorers and all-round fine human beings make a great trip even better.